“Earlier, we used to wade through water to go looking for a dry spot to relieve ourselves. It is not easy to do so when the whole area is flooded. 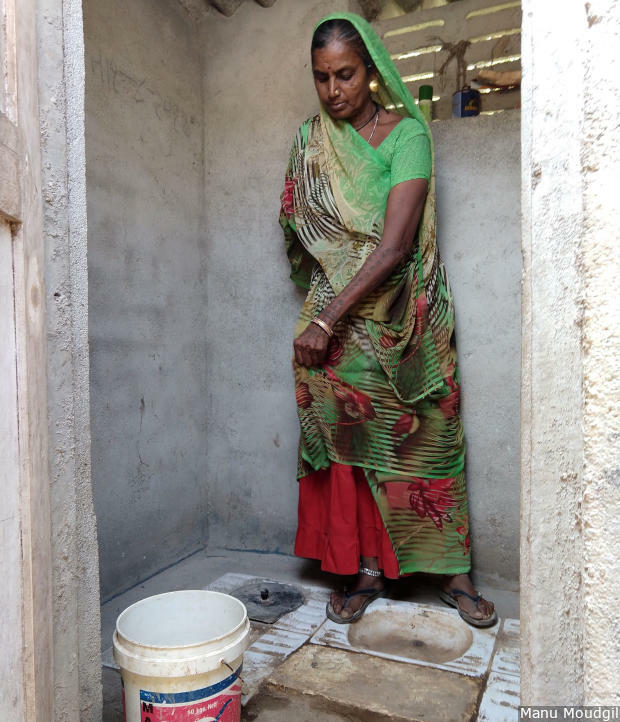 This new dry toilet has made things very easy,” said Chatthi Devi in Bishambhurpur, a village in the Gandak river floodplains of north Bihar’s Paschim Champaran district. Chatthi Devi was referring to a revolutionary urine-diverting dry toilet, popularly called ‘Ecosan’, short for “ecological sanitation”. The people of Bishambhurpur mostly work on small farms or migrate to distant Punjab for work. The village records neck-deep water for at least four-six days almost every monsoon, when the Gandak, flowing down from Nepal, swells and extends her enormous hem. In this transient sea of fresh water, with little land left for using as an open privy, working toilets are particularly important. The Ecosan is a dry toilet built on a raised platform, listed in the Swachh Bharat Mission’s (SBM) guidelines as suitable for dry areas with scarce water supply, coastal and flood-prone areas with high water tables, and rocky areas. Excreta are not flushed out, but stored in sealed chambers to be used as farm manure later. Ecosan toilets return the nutrients to soil, preventing pollution and reducing expenditure on farm chemicals. 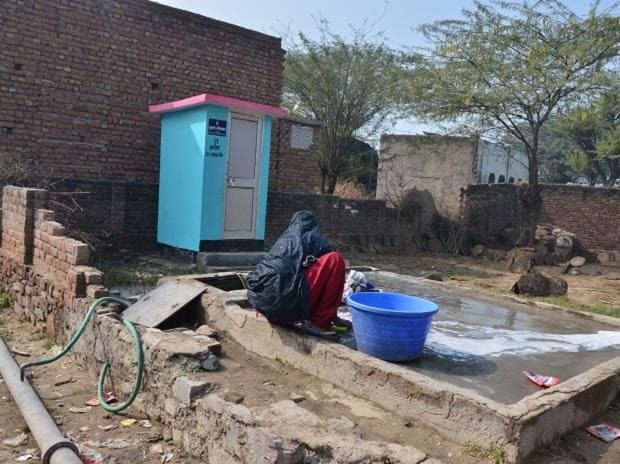 But it has very few takers, due to the SBM’s focus on pit toilets, said Shailendra Tiwari, general secretary of Seva Mandir, a non-profit organisation that is promoting Ecosan toilets in a village near Udaipur, Rajasthan. Bihar is India’s most flood-prone state, with over 73% of its geographical area susceptible to submergence, according to the state water resources department. Around 76% of the population in north Bihar lives under the recurring threat of flood devastation. The families residing in Bishambhurpur settled down here after being displaced eight times due to floods over the last 50 years. All structures here are thus designed with the possibility of flood waters in mind. Houses are made of bamboo and straw that are easy to dismantle, grain stores of mud stand on raised platforms in courtyards and charpoys are often the only furniture. Among these, rows of freshly painted twin-pit toilets--all the same size and shape, some sharing a common wall--stand apart. “These toilets are going to break down in less than two years. 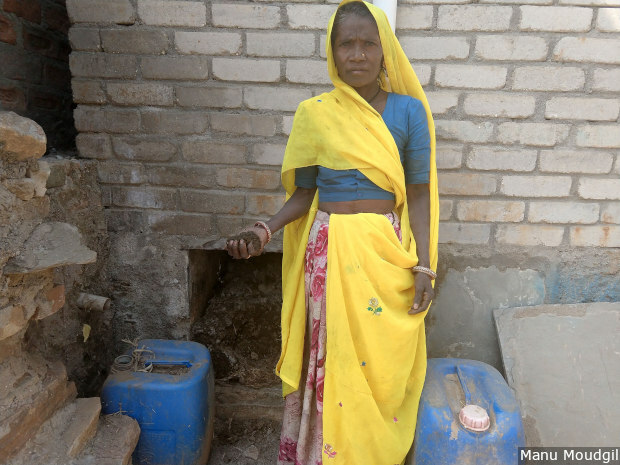 Maybe we will use their bricks somewhere else,” said Chanmiti Devi, looking at the twin-pit toilet that has recently been dug in her backyard. Under the SBM, overseen by the ministry of water and sanitation, families are supposed to construct the toilets on their own, for which they receive an incentive of Rs 12,000. But, as in many places in India, the toilet construction programme has turned into a coercive campaign in Bishambhurpur, in name of achieving the SBM goal of making India open defecation free by October 2019. All the villagers IndiaSpend spoke with said the village panchayat threatened people with denial of benefits from government schemes, such as subsidised rations and pucca houses, till they get the toilets built. A contractor has been hired by the panchayat to do the job. People don’t need to pay right away to get a twin-pit toilet built, but must hand over the government incentive to the panchayat once it is credited to their bank accounts. SBM has achieved 98.8% toilet coverage in rural India and 601 of the country’s 722 districts have declared themselves ODF by February 2019. Pashchim Champaran district will soon be declared open defecation free (ODF), having already reached 100% toilet coverage. However, this ODF status is likely to proliferate similarly non-existent or dysfunctional toilets as found by a Comptroller and Auditor General (CAG) audit team in ODF villages of Uttar Pradesh and Gujarat, as FactChecker.in reported in November 2018. Open defecation free is the termination of faecal-oral transmission, defined by a) no visible faeces found in the environment/village; and b) safe technology for disposal of faeces in every household as well as public/community institutions. However, villages and districts have been declaring themselves ODF after reaching 100% toilet coverage, ignoring the crucial aspect of safe waste disposal. Prema Devi is the only one in Bishambhurpur who has so far defied the panchayat’s diktat to get a twin-pit toilet constructed at her home. “I am waiting for my farm worker husband to come back from his job in Punjab. I want the dry toilet like the one Chatthi has,” she asserted. “Better spend money and get a good toilet than accept a free one that won’t work.” Seven families of Bishambhurpur have saved money to build Ecosan toilets, locally known as ‘faydemand shauchalya’ (useful toilet). 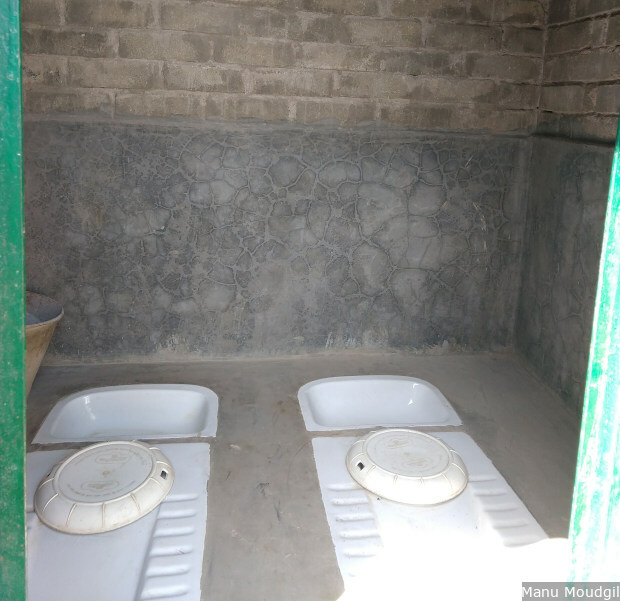 An Ecosan toilet has two toilet pans that open into separate concrete chambers below to store excreta. After defecating, one needs to sprinkle a handful of ash and close the lid. No flushing is required. There are separate outlets for urine and washing so no water enters the excreta chamber. This prevents insect breeding and foul smells, besides accelerating decomposition. A family would use one pan and chamber for five or six months. It is sealed once full and the second chamber is then used. By the time the second chamber fills up, the excreta in the first chamber becomes odour-less compost and can be used as farm manure. The urine is collected in a separate container, mixed with water and also used in the fields as fertiliser. An Ecosan toilet has two toilet pans that open into separate concrete chambers below to store excreta. A family would use one pan and chamber for five or six months. It is sealed once full and the second chamber is then used. The Ecosan toilet thus serves multiple purposes, by completing the natural cycle of nutrients returning to the field where they came from. In contrast, conventional toilets break this cycle by replacing the medium of soil with water, which not only takes the nutrients away but also pollutes the ponds and rivers, spreading diseases such as cholera and typhoid. In urban India, around 70% of sewage is randomly dumped in rivers, seas, lakes and wells, polluting three-fourths of the country’s water bodies, according to a January 2016 IndiaSpend analysis of various data sources. In villages, toilet water is either drained into ponds or, if not properly diverted and treated, contaminates groundwater. On the other hand, farm soil in India is currently starved of nutrients, ranging from deficiencies of 89% for nitrogen, 80% for phosphorous and 50% for potassium, besides the lack of several other macro- and micro-nutrients, according to a report by the standing committee on agriculture, tabled in parliament in August 2016. Thousands of crores are spent on chemical fertilisers to rejuvenate this soil, adding to farmers’ indebtedness and public expenditure on fertiliser subsidies. The pollution from farm runoff of agro chemicals is another story. Diverting composted human excreta to farms is thus a win-win proposition. Most the Ecosan toilets, however, whether in Tamil Nadu, Gujarat, Maharashtra, Rajasthan, Uttarakhand or Chhattisgarh, are being adopted only by non-profit organisations or highly-aware individuals. In Bihar too, non-profit organisation Megh Pyne Abhiyan batted for the Ecosan and convinced the administration to consider these for incentives under SBM as well. Diverting urine to fertilise fields with an Ecosan toilet can save farmers up to Rs 45,175 per hectare. 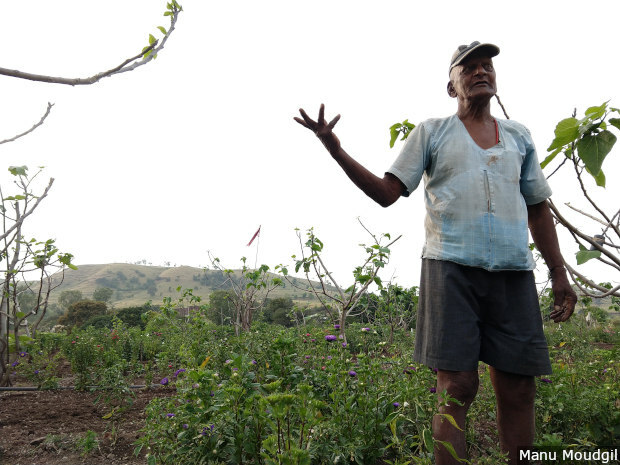 Kerba Wadkar (65) wakes up at 4 am, dons his cap and walks through his small farm. His tall frame, draped in a loose white-blue shirt and grey shorts, bends down every few steps to pick flowers. The pink, purple and red carnations travel for 35 km to Pune’s flower markets, fetching Wadkar upto Rs 20,000 every season. The arecanut trees grown on the same farm get him Rs 30,000 annually. The Wadkar family has six members, including a five-year-old boy, all of them using an Ecosan toilet, promoted in this region as the ‘farmer’s friend’. Kerba Wadkar grows flowers and areca nut trees by using compost and urine from his Ecosan toilet at Darewadi village near Pune, Maharashtra. Besides the usefulness of the compost, it’s the urine that has hooked farmers like Wadkar to Ecosan toilets because it can be collected and used every few days as a fertiliser. Urine contains nutrients such as nitrogen, phosphorus and potassium that promote plant growth. “We tested the performance of tomato, coriander and pea crops and found that fields where urine was used had better yield,” Ganesh Kale of Ecosan Services Foundation, a Pune-based non-profit organisation which has promoted Ecosan toilets in the region, told IndiaSpend. The application of 50 litres of human urine diluted with 500 litres of water reduced fertiliser use by 25% and improved plant growth, fruit yield and quality with a potential additional benefit of Rs 45,175 per hectare, according to a 2009-10 study by the ministry of agriculture’s National Research Centre for Banana in Tiruchirappalli, Tamil Nadu. “I have seen a 20% increase in income and 50% decline in fertiliser use by spraying the urine,” said Shantaram Shankar, who was the first to get an Ecosan toilet in Darewadi. It was not easy, however, to convince people to use their own waste on farms. That is why organisations like Kale’s make a point of opening the first chamber in a village a public event, often attended by a senior government official. In Mamadev Ki Chaapar, a hamlet with a population of around 150 in Udaipur district of south Rajasthan, Ecosan serves a different purpose, avoiding the use of water for flushing toilets. A single well serves the whole habitation for water. While men either go to the city or migrate to far off lands for work, women take care of rain-fed farmlands and cattle. A water toilet is a luxury they can’t afford. A lack of water is one of the primary reasons for low use of toilets across India; currently 600 million people face high to extreme water stress, according to a June 2018 NITI Aayog report. Ecosan circumvents this challenge and was adopted by 929 families in Rajasthan with support from Seva Mandir, a non-profit organisation based in Udaipur. Sarsi Bai shows compost extracted from her Ecosan toilet in Mamadev Ki Chaapar village near Udaipur, Rajasthan. One reason for the slow spread of the Ecosan is that it is 33-100% costlier than a conventional toilet. An Ecosan toilet contains two pans, a concrete substructure with two chambers and water-proofing. It may cost between Rs 20,000 and Rs 30,000 depending on the location, cost of transport and modifications required. Since the Rs 12,000 incentive under SBM is given after the toilet has been constructed, those wishing for an Ecosan toilet first have to arrange the entire amount on their own. In Chhattisgarh, a different model for building Ecosan toilets was adopted. Besides the incentive under SBM, money from the District Mineral Foundation and panchayat discretion fund under the 14th Finance Commission was also used to build Ecosan toilets. Hakku Ben was making dung cakes to be used later as kitchen fuel. She had already swept the house and done the puja for Dussehra and was waiting for a tanker to supply water to her house at Gujada village in arid Bhavnagar district of Gujarat. The climate here is mostly dry even though the sea coast lies just a couple of kilometres south of the village. The government water supply comes every 2-3 days. The village lies on a large swathe of limestone that needs to be cut with machines before toilet pits can be dug. It is thus an ideal location for Ecosan toilets. Utthan, an Ahmedabad-based non-profit organisation, got four Ecosan toilets built in 2007. One of the beneficiaries was Hakku Ben, who recently shifted allegiance to a water-based toilet. The problem was visiting relatives. Dhari Ben explaining the functioning of the Ecosan toilet installed in her home in Gujada village of Gujarat’s Bhavnagar district.